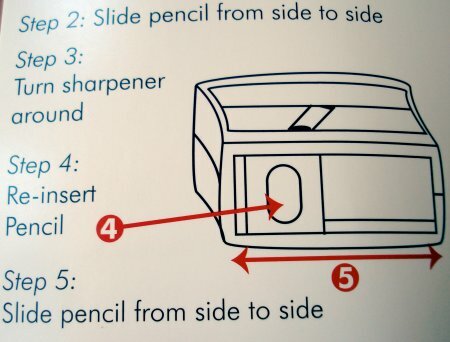 How can one sharpen a carpenter’s pencil? The International Arrivals sharpener didn’t quite seem to do it. Here is another attempt. 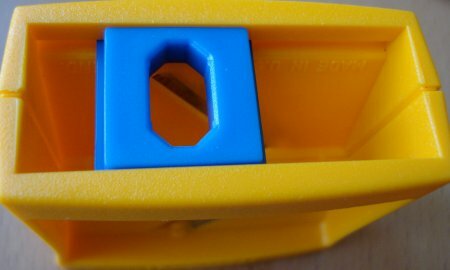 From Keson, it is a bright yellow plastic block with four blades. 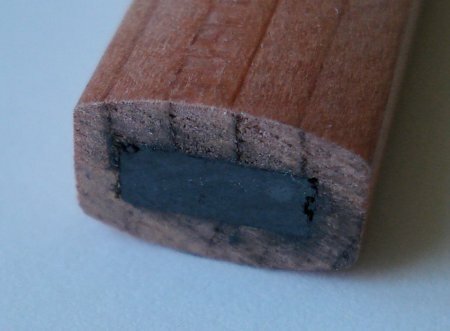 The pencil is placed in a slot (blue plastic) and one slides the pencil back and forth, the wood being sliced away. 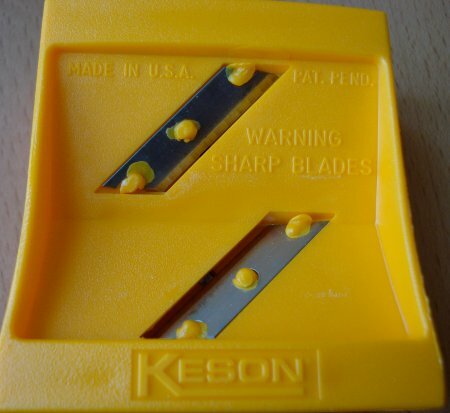 One end and pair of blades is for the long edge of the pencil, and the other end and blade pair for the short edge. It does what it claims, creating a nice wedge of lead. Yet there are some other pencils out there – such as the International Arrivals – which don’t fit in the blue slots. Some European oval pencils (I tried a Viarco) are too loose and slide around. Others from Lyra are too large to fit. The Mastercraft and Faber-Castell pencils aren’t ideal fits either. 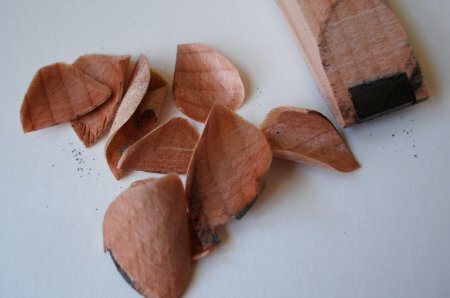 As well, one should be aware that this sharpener emits wood and graphite residue on both sides – it is very messy. 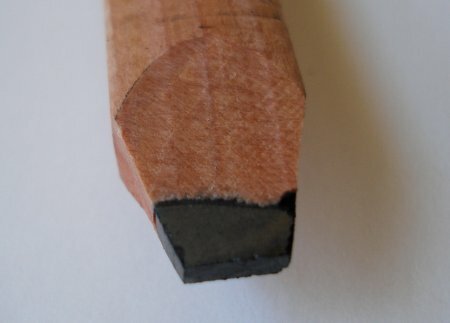 The above issues noted, it seems like the best sharpener available for pencils that it can accommodate. This is the second of a four-part mini-series. Tomorrow: Stonemasonry pencils. Hmm, good info that made me realize one of the holes in my graphite collection. 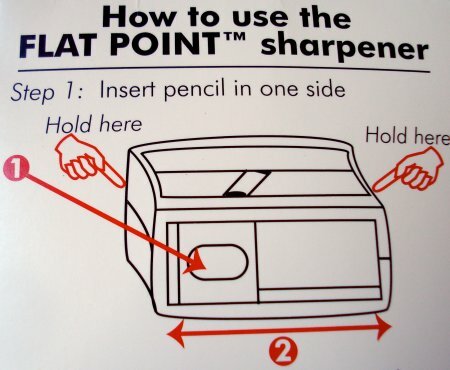 Will have to keep an eye out for this pencil format and most efficient sharpener. Looking forward your next two installments in this mini-series of blog entries. Beautiful shavings — they look like petals. Amazing instrument! And yes the shavings are a work of art in themselves. These pencils and sharpeners are available on http://www.Ebay.com. Search Keson carpenter pencils. Scroll down a ways. I bought one sharpener, and 12 pencils, and love the points on the pencils. They look lots sturdier than pointed. Lou Lowell, Mchigan. 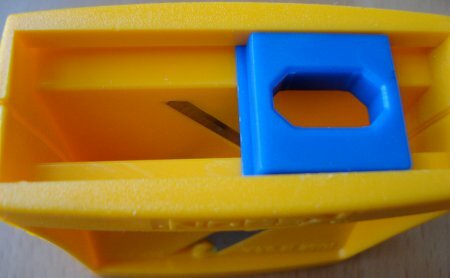 This sharpener is available at Home Depot. It is an orange version of the one shown in the link offered by Sean C.